Yet despite our envy for today’s demand generation resources, reality seems to be painting a different picture. Sales reps are not producing five times the volume in half the time. Profits are not skyrocketing, and while business revenues are certainly up from the time I was a frontline salesperson, that has more to do with inflation than effectiveness. Make no mistake, there are clearly businesses that are taking advantage of the world we live in. On one hand, it’s easier than ever to grow a billion dollar business; and on the other, it’s more difficult than ever to run a $50 million business maintaining 20-30% growth rates. As the Chinese curse goes, “May you live in interesting times.” While there’s more opportunity than ever before, it’s also more complex and challenging than ever. As Inbound Marketing, Sales Development and modern sales strategies have increased in popularity and investment (together, it's what we call Demand Generation) we decided to see how companies were progressing. So we spent much of the last year digging deep to see what we could learn about success, the journey to get there and the potholes that prevent companies from thriving. 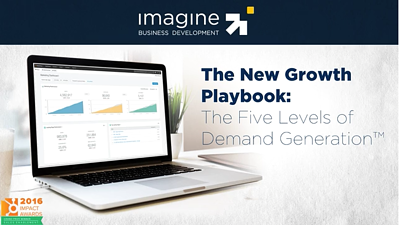 The result is shared in this video The 5 Levels of Demand Generation. You’ve launched a modern approach to demand generation and sales growth. You’re implementing at least one component of today's playbook. You’re seeing (or you’ve seen) an initial increase in lead generation and possibly even sales growth. The challenge is that the focus is still more on tasks, then on gaining traction; and you’re seeing (or will soon see) diminishing returns and possibly even regression. The emerging phase feels quite a bit like a tornado. Challenged with the inertia of past approaches, while also working to find the right formula. Companies at this stage are still challenged to find the market/message fit that stimulates demand and the right processes to transform interest into revenue. While demand generation efforts are ongoing, alignment is still off. Getting salespeople to utilize content and provide feedback is big challenging. At this stage, there is not enough data to be able to draw the right conclusions, and there’s a battle to allocate the right resources to drive results while maintaining a sustainable ROI. Another major challenge is the ability to track the strong sales (and marketing) talent. The lack of sustained, quality lead generation & management creates too much reliance on salespeople and is out of alignment with how buyers learn, engage and decide. You’ve moved beyond the basics and you’re getting traction. You’re implementing a full demand generation strategy - addressing both the sales and marketing disciplines - and while sales and marketing are working together, it’s still not fully aligned. You see increased lead generation, opportunities for salespeople and growth, however consistency and predictability are still bumpy. At this stage, the demand generation “engine” is beginning to form. With clearer data emerging, you’re able to make more data-backed decisions and your iteration cycles are improving in both speed and impact. You're beginning to see results and you have a stronger base of data with which to work. The challenges here center on creating predictability and consistency. Despite the increase in lead volume and quality, the sales team often struggles to adapt to the new world. Turnover often increases as the demand for salespeople change and the realization of what is needed becomes apparent. You’ve gained a distinct growth advantage. With a fully aligned, holistic demand generation, you’re enjoying the accelerated growth rates, predictability and scalability that fully aligns your go-to-market efforts. Your “business-math” is strong, enabling you to make investments in your business confidently. The challenge you face at this stage is maintaining effectiveness and staying ahead of the game. At this phase of demand generation development, you have not built a full-scale demand generation team (like Level 5 companies have). With the rapidly changing nature of both the buy and sell sides and the breadth of knowledge disciplines needed, you must continue to find ways to drive improvements and stay ahead of the game. The first cause of failure is often success. Complacency is the danger here. You must continue to test, iterate and challenge your status quo to sustain success. You’re fully engaged in scale-up mode. Your growth rates are accelerating with increasing velocity. The challenge you face now is locking in the capabilities, building out a full team and ensuring your velocity continues to accelerate faster than your growth rate. The rate of growth requires that you add new types of clients and typically compete with higher levels of competition - often larger and more sophisticated. As the company moves from mid-market to enterprise, new disciplines, systems and talent must be integrated at rapid rates. You’ve achieved predictable, fast growth; growing at a rate 50-100% (or more) faster than your peer group. You’ve built a demand generation asset that not only enables you to grow at faster rates, it’s also lowering your cost for growth. You’re on your way to a successful IPO. Your biggest challenge is building your infrastructure and transforming to a solidly established mid-market to large company. Things continue to move at fast speeds. Given the nature of success you’ve had, new entrants are regularly entering your space. New technologies are disrupting the not-so-old technologies you leveraged your success in. Your customers needs continue to evolve; and your organization is constantly looking to attract more revenue from your existing customers and enter new markets, or new disciplines, to attract new customers. Lastly, given your success, the talent that you’ve come to rely on is actively recruited by others looking to emulate your success. Keeping up with everything, while keeping things aligned and forward-leaning is the key challenge you must manage.